Kite festival can truly be said to unite the world, observed as it is in so many countries at various times during the year. 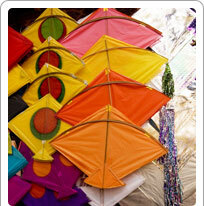 In Jaipur, like in the rest of India, the kite festival is each year in the month of January. Makar Sankrati on 14th of January is the day when sun transits into the Northern hemisphere. This is also the day of kite festival. In Jaipur, this festival is so popular that the sky is virtually hidden behind colourful kites in all shapes and sizes. The Jaipur kite festival attracts the best kite flyers from across the world. At the Jaipur polo grounds, the festivities last for three days. There is an impressive inauguration ceremony with pomp and splendour. The Indian Air Force helicopters add to the fun and revelry by letting loose a huge number of kites in the sky. The Jaipur kite festival has exhibition flying and a kite flying competition. To win a trophy in this competition is a matter of prestige! Every evening the participants enjoy a celebratory dinner. Palace and the Hawa Mahal is a unique experience.